Alan and Keith were getting married on their farm in Virginia and wanted to balance the solemnity of the event with the rustic quality of the setting. The grooms-to-be had created an online video save-the-date for their guests, but for the invitations, they decided that letterpress would help underscore the formality of the occasion. The invitation, according to Alan, had to convey several things at once to set the tone: a sense of formality (despite the fact that the reception was to be held in a barn, it was not going to be a casual event); the fact that the ceremony itself was going to be quite traditional; and the occasion's overall blend of elegance and rusticity. In his words, "we needed an invitation that tempered the formal and traditional with some sort of country element." 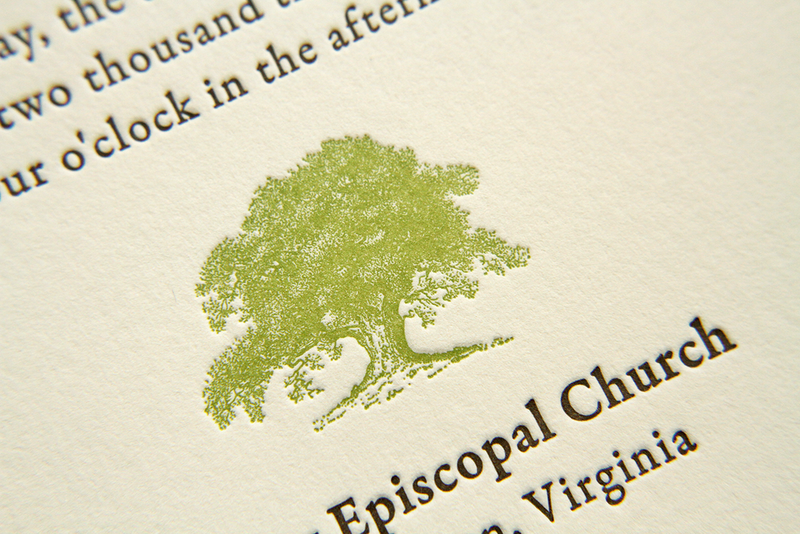 They felt the Californian design was almost there, but wanted to use a different oak tree image. The oak was their chosen motif, partly for symbolic reasons — the mighty, strong, sheltering, beautiful oak is an apt metaphor for a lifelong commitment — but it held literal meaning, as well. The couple planted a pair of young oaks on their farm, and are planning to watch them grow old together. As Alan said, "we hope we can look back on them one day and say, 'those were planted the year we got married.' "
Posted in wedding invitations and tagged with ecru white, 300g, espresso, frog, Californian. February 5, 2014 by Sarah Arneson.